By Robert L. Moshman, Esq. Death requires no additional downsides. Death is almost always an inferior option to all the other alternatives that involve living. Yet, all other things being equal, some states provide estates with favorable amenities, such as mellow probate rules and an escape from state death taxes. Several jurisdictions are actively vying to become destination locations for your wealth (and the last stop for you). There are, however, states that impose burdensome death taxes and unnecessary expenses on estates. Some jurisdictions will trap heirs in a punitive probate process that could be mistaken for Hell. Here, we attempt to identify some of the jurisdictions that might be worth avoiding. For example, living in New York may be an expensive option. Also, try not to die in New Jersey. Past issues of The Estate Analyst have explored the rise of venue shopping for estate planning. In Re-Nesting Your Estate (The Estate Analyst, July 2011), it was observed that the top Federal estate tax rates were at 60% or higher for half a century, from 1934 to 1984. In fact, for 35 years (from 1941 to 1976), the rates reached 77%. Exemptions were relatively low. In 1973, for example, there was a top Federal estate tax rate of 77% for estates exceeding $10 million and an exemption of $60,000. The state death tax credit arrived in 1976 and ultimately unified state death taxes, for the most part, throughout the United States. This credit essentially invited every state to siphon off some of the revenues that were already going to pay Federal estate tax. It didn’t add to the taxpayer’s overall tax burden. Even states that were not previously imposing their own death taxes couldn’t resist this free revenue. Every state in the union eventually signed on by enacting a “pick up” or “sponge” tax to absorb a portion of any tax that would otherwise go to the Federal Treasury. The net effect, for the most past, was the neutralization of state death taxes. In 2001, the state death tax credit was eliminated as part of the repeal of the Federal estate tax. Uniformity in state death taxes ended. Each state went its separate way. “Decoupling” from the Federal estate tax train was the prevalent analogy of the time. A better analogy might have been the Tower of Babel because, without a tax credit in common, all the states went in separate directions. The entire premise of estate planning has been reversed. The federal estate tax exemption is projected to reach $5.43 million for 2015 with a top tax rate of 40%. With portability of unused spousal exemptions, married couples have $10.86 million of exemptions at their disposal. Estates also won’t have any capital gains on appreciated assets held at death, thanks to the reinstatement of the stepped-up basis approach. Many people will not require credit shelter planning or qualified terminable interest planning based on their lack of federal estate tax exposure. In place of confiscatory federal estate taxes and neutral/irrelevant state death taxes, many estates now have the exact opposite. The Federal estate tax monster is now dead for most people; in several states, state death taxes are the number one threat. Planning can mean credit shelter trusts and gifts geared to state rules. Or, thanks to the ability to work from home, as well as to use email, Skype, and to set up new LLCs in new locations, many taxpayers can pick up their roots and start over in a more favorable state for wealth-related purposes. Alaska, Florida, Nevada, South Dakota, Texas, Washington, and Wyoming have no state income tax. Alaska actually pays an annual dividend to certain residents who qualify. New Hampshire and Tennessee tax only dividend and interest income. In terms of “livability,” a study that evaluated factors, such as education levels, crime rates, income, and weather, came up with a list with New Hampshire, Utah, Wyoming, Minnesota, Iowa, Nebraska, New Jersey, Vermont, Idaho, and North Dakota in the top 10. Other studies for retiree destinations focus on cost of living, availability of doctors, transportation, and cultural opportunities; for such issues, the results break down by individual cities rather than states. In the late 1990s, Alaska, Delaware, and Nevada took the lead in enacting legislation that permitted self-settled trusts and could protect grantors from creditors. These protections may affect where taxpayers ultimately nest their assets. In Asset Protection Jurisdictions Compared (The Estate Analyst, May 2012), we interviewed attorney Steven J. Oshins (AEP, Distinguished), who created annual rankings of the best states for domestic asset protection trusts. The 5th annual list for 2014 (as published in Steve Leimberg’s Asset Protection Planning newsletter) had Nevada, South Dakota, Ohio, Tennessee, Alaska, Wyoming, Delaware, Missouri, New Hampshire, Hawaii, Rhode Island, Utah, Virginia, Mississippi (pending), and Oklahoma. Nevada has been dynamic and aggressive in enacting the most favorable estate-related rules and Oshin’s influence on this process bodes well for Nevada’s long-term attractiveness for trusts and estates. Note: Steve Oshins was also most gracious in arranging Return of the DING Trusts (The Estate Analyst, April 2013), in which the specialized technique of Delaware Incomplete Non-Grantor trusts was reviewed. Ironically, the technique was then only viable in Nevada, making it a NING Trust. Typically, California took steps to tax DING trusts and New York immediately explored following suit. In our review of DING trusts, we had the opportunity to speak with Jonathan Blattmachr about the genesis of domestic asset protection. Not every state with positive tax and asset protection rules is right for everyone. Alaska has moose, ice road trucker Lisa Kelly, and so much cold you could be frozen from the neck down before you realize it. Nevada has Las Vegas and desert and isn’t everyone’s cup of tea. Delaware is tiny, flat, and inconveniently located—like Staten Island with statehood. It’s a good place for a corporation to exist, but what’s the point of living there? As for North and/or South Dakota…bleh, meh, and feh. The only reasons to be there are to a) wait for Godot or b) settle a score with Lorne Malvo. On the other hand, there are places one might want to specifically escape from. Consider the disparate income taxes that apply in certain states. Credit Union Times, reporting on taxes affecting middle income earners, identified its top five as California with a rate of 9.3%, Oregon with 9%, Iowa with 8.98%, District of Columbia with 8.5%, and Hawaii with 8.25% income tax. Looking at the highest tax brackets, however, The Tax Foundation identifies California as the top tax state with a rate of 13.3%, followed by Oregon (9.9%), Minnesota (9.85%), Iowa (8.98%), New Jersey (8.97%), District of Columbia (8.95%), Vermont (8.95%), New York (8.82%), and Maine (7.95%). But even this chart doesn’t account for all factors. If you live in New York City, for example, there is an additional income tax, ranging from 3.534% for income over $12,000 and rising to 3.876% for income exceeding $500,000. The cost of living is another factor. Hawaii’s cost of living is 161.7% of the national average, and Alaska’s is 131.1%—it is expensive to transport everything to these locations. 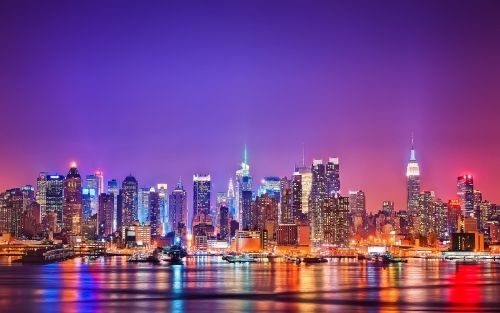 On the mainland of the United States, New York’s cost of living is 134% of the national average. It is followed by Connecticut at 133.8%, New Jersey at 129.5%, and California at 128.6%. There are 19.6 million people living in New York State. Of those, 8.4 million live in New York City, and several million more commute into the city to work. In plain English, New York City is a very expensive place. It now costs $14 to cross bridges and tunnels to get into New York City, an extra $1 for every gallon of gas, $35 to park your car for 2 hours, and 100% more for rent than anywhere else. If you don’t have rent control and a strong income, you can’t afford to live in New York City. If you are trying to build an estate that you can leave to your children, New York’s taxes and expenses will completely undermine your efforts. Many of the larger states have bureaucratic probate processes that are costly, frustrating, time-consuming, and that keep revocable living trusts in business for the sole purpose of avoiding the whole unpleasant experience. For example, New York has a beastly probate process. Many other jurisdictions have reformed their probate codes and estate administrations, but New York only gets worse. Some states have carved out “small estate” shortcuts for estates of less than $50,000 or $100,000. Other states have reformed their entire processes to make avoiding probate completely unnecessary. For our purposes, the burden of probate administration has not been fully evaluated to compare the best or worst places to die because estates can avail themselves of trusts and professionals and deal with whatever administrative burdens may arise. Nevertheless, there are a number of states that are far worse than others for estate administration. There are six states with inheritance taxes and two that have both estate and inheritance taxes. The inheritance tax rates include 9.5% in Tennessee, 10% in Maryland, 15% in Iowa and Pennsylvania, 16% in Kentucky and New Jersey, 18% in Nebraska, and 20% in Indiana. Notes: Indiana is phasing its inheritance tax out by 10% a year until 2022. Tennessee has a $1 million exemption from its tax. In 2011, Bill Bischoff wrote an article for the Wall Street Journal’s SmartMoney entitled “Estate Taxes: The Worst Places to Die” and identified New Jersey, Ohio, and Rhode Island as the three states with state estate taxes that apply with less than $1 million of exemptions available. Since that time, Ohio has abolished its estate tax, and Rhode Island has raised its estate tax exemption from $675,000 in 2009 to $850,000 in 2010, then indexed it for inflation, and then increased it to $1.5 million for 2015. New Jersey has left its estate tax exemption at $675,000, but proposals to increase the exemption have been made repeatedly, and New York’s recent increase of its estate tax exemption may finally shame its neighbor into taking action. New York had an estate tax exemption of $1 million for many years, but, in 2014, enacted legislation that would boost the exemption to $2,062,500 and then increase it in phases until it reaches the Federal exemption level in 2019. But there is a slight catch. If an estate has 5% more than the exemption amount, the entire estate is subject to the estate tax. Writing in Forbes, Ashley Ebling argued that the resulting tax on the assets exceeding the exemption is equal to a tax of 164%. In reality, the overall top estate tax rate in New York remains 16%, but the colorful warning about the cliff rule is worth noting. In New Jersey’s defense, not every estate will have inheritance tax at all. Inheritance tax applies to transfers to certain classes of relatives or nonrelatives. New Jersey’s inheritance tax does not apply to transfers to spouses, parents, grandparents, children, grandchildren, and descendants. The tax applies when transferring assets to more distant relatives, such as siblings, cousins, in-laws, or unrelated friends and acquaintances. Iowa has a similar approach. Indiana is similar but also exempts gifts to siblings. The other states have a variety of exemptions. Thus the existence of an inheritance tax is not an automatic negative factor for every estate. Executors can get immediate access to wills in safe deposit boxes. Self-proving wills do not require appearances by witnesses. Interested parties can serve as witnesses without their bequests being disqualified. Surrogate courts have helpful websites and probate clerks, making it possible for pro se executors to get through the process. Passaic County has a traveling “night court” that has monthly court sessions in four different municipalities, making probate far more accessible. The Bad: Having an estate tax with a relatively low exemption amount, as well as an inheritance tax to contend with, would be sufficient to identify New Jersey as the worst place to die for estate tax purposes, but there is so much more to dislike about the New Jersey estate administration process. New Jersey also presumes that gifts made within three years of death are in contemplation of death and are included in the decedent’s taxable estate. The estate has the burden of proof to overcome the presumption. The Fugly: But there is more. New Jersey is still coupled to the Federal system that was repealed in 2001. So the convoluted calculation of New Jersey’s estate tax involves working with the Federal Estate Tax Return Form 706 from 2001. The net result is that taxpayers can’t easily or accurately determine what their New Jersey death tax liability is going to be. This is unacceptable. Then, to enforce the collection of the estate tax, New Jersey requires banks to withhold 50% of the decedent’s balances until tax waivers are obtained. However, the state often takes six to eight months after the estate tax return is filed to issue tax waivers. Making matters worse, many estates don’t realize that any return is required when there is no tax due. Many estates first realize that a tax waiver is needed when the estate finally sells some real estate and the buyer’s title company requires funds to be held in escrow until a return is filed and a waiver is obtained. In many cases, this is years after the decedent’s death. The obvious solution is to overhaul New Jersey’s death taxes with a reasonable exemption and an understandable tax rate. Until that arrives, don’t die in New Jersey.